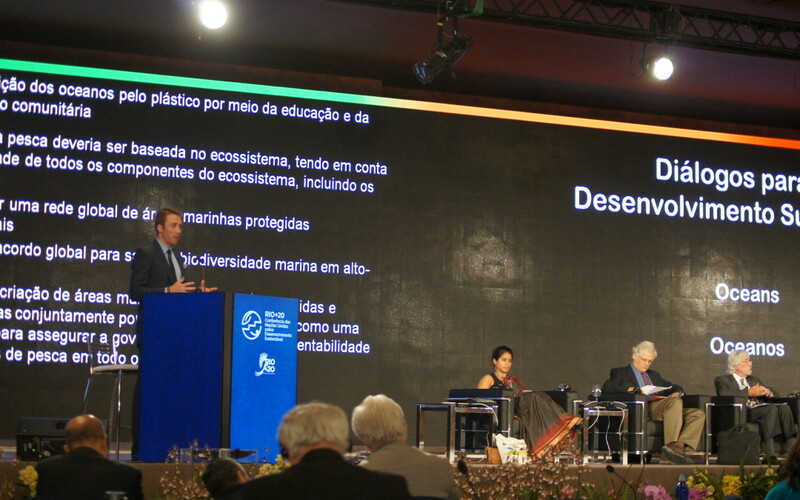 Philippe Cousteau, grandson of famed ocean explorer Jacques Cousteau, opened the Rio+20 Oceans Dialogue today as moderator of a panel of 10 international ocean experts sitting on stage alongside 10 recommendations critical to advance global ocean management. 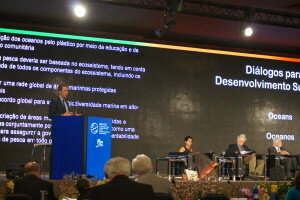 “Oceans are considered too big to fail, but in fact they are failing,“ said panelist Richard Delaney of the Global Ocean Forum at the start of the public discussion organized by the Brazilian government. Each panelist acknowledged the myriad problems facing the oceans – from ocean acidification, unsustainable and illegal fishing to land- and marine-based pollution – with an eye toward sending a strong message to the United Nations delegates charged with producing a final political document on June 22 at the Rio+20 UN Conference on Sustainable Development. All panelists emphasized the urgent need to utilize science and technology to help mitigate the negative environmental impacts that are degrading the oceans. Others conveyed the need for a strong international global framework to protect the high seas and its biodiversity, which is the 68% of ocean areas not under national jurisdictions or currently protected by international policies. The global blue economy is losing 10-20 million tons of fish a year from ocean mismanagement, according to British Columbia University professor Ussif Rashid Sumaila. His recent study shows that ocean conservation’s return on investment is $3-7 per dollar spent. “The economics are there, we just need the political will,” said Sumalia, who considers fish as an indicator of global ocean health. Following the panel remarks, the microphones were turned over to the audience to ask questions and provide their input on the 10 recommendations that came out of an interactive online discussion and voting initiative. 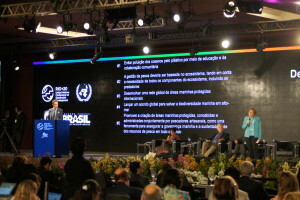 The Rio+20 Dialogues were set up by the Brazilian government to offer a venue for the public to provide their input on the seven critical issue areas being discussed in the UN policy-making process.